Across the country, museums are looking for ways to expand visitors’ social experiences as well as become community gathering spots. (Consultant Nina Simon documents the cutting edge in her blog, Museum 2.0.) 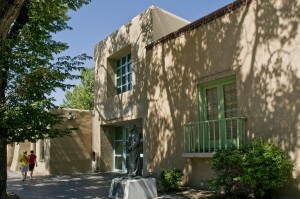 The History Museum does its part with hands-on exhibits, lectures and performances, and a shady Palace courtyard in the heart of downtown Santa Fe, perfect for a moment of serenity. On May 20, we’re taking that one step further by offering a place to grab a snack or a light meal, hang out on a second-story terrace with a great view, get a little work done courtesy of our free wi-fi, and re-charge before charging back into the exhibits. The Plaza Cafe, a Santa Fe Plaza mainstay since 1905, has agreed to run the long-awaited Cowden Café, on the museum’s second floor. The café will serve daily from 10 am until 4:30 pm, and on Friday from 11 am until 7 pm. Service will be “upscale self-service without the attitude,” said Daniel Razatos, whose family has operated the Plaza Café for more than six decades. All menu items will be made from scratch and designed to be quick, healthy and fresh – perfect for people on a one-hour lunch break. Beverages will include premium coffees, teas, beer and wine, creating an opportunity to enjoy not only the exhibits but sunset hors d’oeuvres and, sometimes, live music on the café’s Phyllis and Eddie Gladden Terrace. Brothers Andy and Daniel Razatos operate the Plaza Café, founded in 1905 and taken over by Dionysi Razatos in 1947. A longtime favorite among locals, tourists and the occasional celebrity, the restaurant whips up a mix of Greek, New Mexican and down-home American cuisines – everything from moussaka to enchiladas to chicken-fried steak. Visitors who only want to go to the café can do so for free; access to the exhibits will remain limited to paid attendees. Up to 20 people can sit inside the café; the outdoor terrace has room for 50 people. The museum is working out the final tweaks to a wi-fi system that will enable members of the public to log on to their computers while visiting the café. 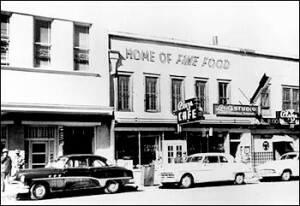 The Cowden Café is named for a historic ranching family, whose holdings at one time straddled the New Mexico-Texas border from Jal to Santa Rosa. Their legacy was detailed in the book Riding for the Brand: 150 Years of Cowden Ranching (University of Oklahoma Press, 2006), by Michael Pettit. Part of the 1-year-old History Museum’s original design, the café and terrace have been closed to the public while details on the café’s operation were worked out. The state Board of Finance agreed to the contract’s terms on April 20, clearing the way for a final construction push. Clearly, the “Get Into It” concept worked: More than 20,000 people lined Lincoln Avenue and packed into galleries during last year’s Memorial Day weekend to be part of the grand opening. As the museum’s first anniversary approaches, attendance has surpassed 150,000, more than doubling the annual attendance of the museum’s predecessor, the Palace of the Governors. In case you’re wondering: AAM is the premier organization for more than 3,000 museums, including art, history, science, military and youth museums, as well as aquariums, zoos, botanical gardens, arboretums, historic sites and science and technology centers. Here’s a full list of winners. Now, get cracking on voting for your favorite “Get Into It” ad by clicking on comments, below. An old saying contends that an army runs on its stomach. But for museums, there’s no running without volunteers. 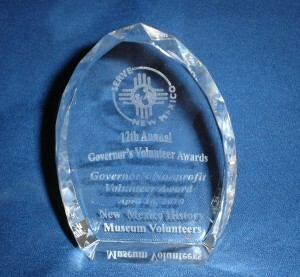 Last week, the New Mexico History Museum’s many volunteers were honored with a prestigious award by the Governor’s Commission for Community Volunteerism. The Governor’s Nonprofit Program Award recognized the museum’s 112 volunteers who last year donated 9,342 hours of unpaid service. 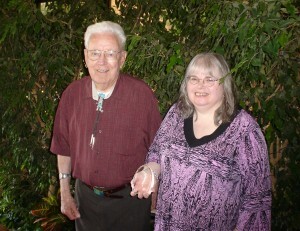 The award was given during a banquet at the Hilton Hotel in Albuquerque, where an estimated 600 volunteers and program staff represented efforts that ranged from foster grandparents to combating homelessness, addictions and teen pregnancy. Lt. Governor Diane Denish, co-chair of the commission, said that volunteer efforts in New Mexico last year accounted for $1 billion worth of work that might not otherwise have gotten done. 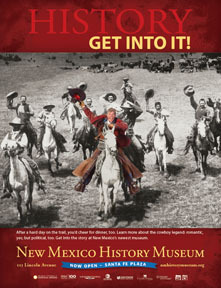 (They) conduct tours of the Palace of the Governors, assist hundreds of school groups from throughout New Mexico, man our Information Desk, lead informative historic walking tours of downtown Santa Fe, act as Gallery Guides for the new 26,000-square-foot exhibits space, and answer “wayfinding” questions throughout the Museum’s campus. Our volunteers assisted at every major 2009 History Museum event including Opening weekend, Spanish Colonial Days, Gem and Mineral Show, Mountain Man Rendezvous, Native American Artisans Indian Market Celebration, Christmas at the Palace, Las Posadas, and new exhibit openings and lectures. They provide the personal touch that insures that visitors from youngsters to senior citizens have a welcoming and memorable museum experience. Our volunteers who work behind the scenes at the Museum assist staff with archival processing and arrangement of photographic and manuscript collections to aid in proper housing and storage of fragile materials, and to assist with access and research. Volunteers in the Museum’s Collections department helped to successfully move over 12,000 museum objects, including 3,706 costumes, accessories and textiles, into our new environmentally sound 8,381-square-foot storage vault. As staff perform curatorial, administrative, and archival duties for our collections and exhibits they greatly appreciate the many talented volunteers who assist “backstage” at the Museum. John Ramsay accepted a last-minute invitation from Patricia to attend the event and said it was just another never-know-what-to-expect day in the life of a volunteer. For the last 14 years, Ramsay has volunteered at the History Library, most of that time “in the bowels” of archived documents. While helping with cataloguing and such, he’s honed an interest in Southwest history deep enough to lead him to contribute a chapter to a book that will be published by UNM Press this fall. Ramsay also serves as treasurer of the New Mexico Historical Society and says that tending to such interests is part of keeping active. The History Museum applauds every one of its volunteers for the sacrifices they’ve made to make us a better institution. To us, this award simply confirms what we’ve long known: We can’t do it alone. Whether it’s meeting new people or working with old photographs, sharing your knowledge of the past or getting out the word on new exhibits, the History Museum can help you expand your horizons. For information on our volunteer programs, contact David Rogers at 476-5157. 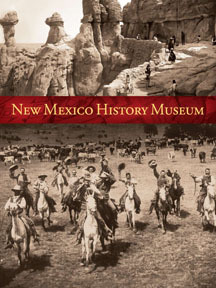 True West Magazine has given us the early word that its May edition will name the New Mexico History Museum as the nation’s top Western Museum. Boggs writes that he admires the 96,000-square-foot building’s architecture, including the 300 handmade arrows that dangle from the ceiling in the core exhibit’s Pueblo Revolt area. Also in the magazine is an article noting 25 kid-friendly museums, and it names the Native American Artisans Portal Program (left) at the Palace of the Governors. Other museums getting the magazine’s Top-10 Western Museums nod: the Adams Museum & House, Deadwood, S.D. ; Buffalo Bill Museum & Grave, Golden, Colo.; Panhandle-Plains Historical Museum, Canyon, Texas; High Desert Museum, Bend, Ore.; Plains Indian Museum, Cody, Wyo. ; National Oregon/California Trail Center, Montpelier, Idaho; Boot Hill Museum, Dodge City, Kan.; Cripple Creek District Museum, Cripple Creek, Colo.; Rim Country Museum, Payson, Ariz.
Boggs, who’s been honored four times with a Spur Award from the Western Writers of America, selected the winners for this annual award based on his extensive travels, research and firsthand experiences in visiting Western museums each year. He analyzed their grand showcases of the American West in 2009—“and they had to be really cool,” says Boggs. In honor of the 100th anniversary of Fray Angélico Chávez’s birth, the History Museum’s Library, which bears his name, will hold a daylong symposium in the auditorium this Saturday. Check out the schedule below. You’re invited. It’s free. And, if you’re among the first 200 to arrive, you’ll receive a commemorative copy of Jimmy Santiago Baca‘s poem written in honor of the friar and hand-printed on the Palace of the Governor’s historic presses. 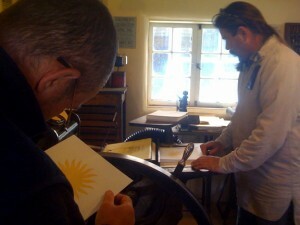 Tom Leech (left, in photo below) and James Bourland (at press, in photo below), the skilled hands of the Palace Press, produced a stack of the commemorative poems on Tuesday. The sun image on its cover came off of the 1899 Chandler & Price machine once used to produce the fabled Estancia News Herald. 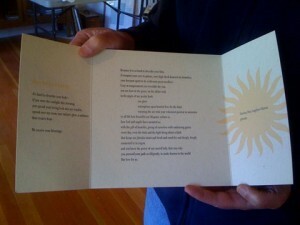 The poem was printed on the Vandercook Press in a Bodoni Condensed font. to all life how beautiful our Hispanic culture is …. The beauty of that culture was threaded throughout Chávez’s life. 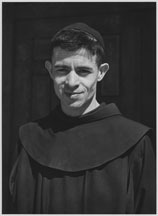 Born Manuel Ezequiel Chávez in Wagon Mound, N.M., Fray Angélico was ordained as a Franciscan, served several parishes in New Mexico and was instrumental in renovating the church in Peña Blanca – a true hands-on effort. The murals he painted of the Stations of the Cross used images of himself, his family and parishioners. He also renovated churches in Domingo Station, Golden and Cerrillos. As an Army chaplain, he was present for the World War II beach landings at Guam and Leyte and, during the Korean War, was stationed at Fort Bliss, Texas, and Kaiserslautern, Germany. While digging for the golden nuggets of Franciscan history in the archdiocesan archives, he instead came across baptismal, marriage, and death records that revealed much about the families who had settled the region. He wrote: “It was like the case of a miner who sifted a hill of ore for gold, setting aside any silver he encountered; in the end the silver far outweighed the gold. 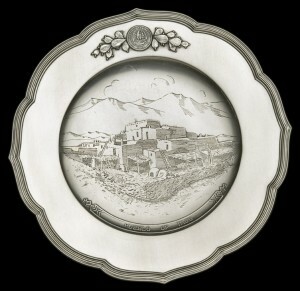 The only thing to do was to render the silver useful.” He compiled the silver and published the Origins of New Mexico Families: A Genealogy of the Spanish Colonial Period in 1954. Genealogists searching for their familial roots have found the book invaluable. A finely rendered sketch of the young friar, the portrait is, contrary to his recommendation, displayed as a work of art. 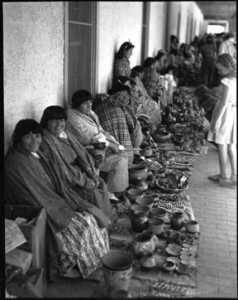 Funding for the event was made possible by the New Mexico Humanities Council. The event is also supported by the Center for Southwest Research, University of New Mexico, and has been designated a We the People project by the National Endowment for the Humanities and the New Mexico Humanities Council. Military service has its advantages, but alas, dining off of Tiffany silver isn’t one of them. At least, not anymore. 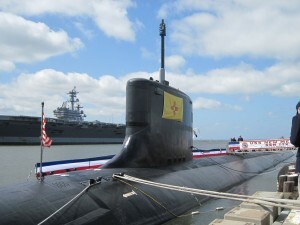 Last Saturday saw the commissioning of the new USS New Mexico, namesake of a fabled World War II battleship reborn as a $2.25 billion nuclear submarine. 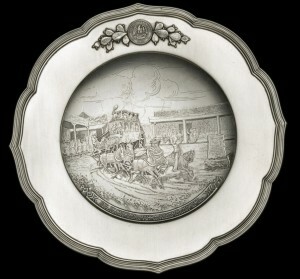 Besides carrying the Land of Enchantment’s name, the sub carries something precious to New Mexico: two dessert plates from a 56-piece Tiffany silver service created for the original USS New Mexico. 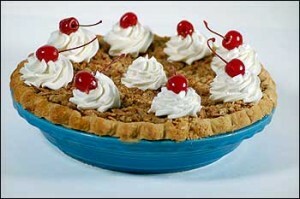 And, no, there won’t be any breakfast on Tiffany’s plates served; they’re for display purposes only. 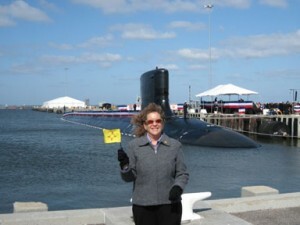 Dr. Frances Levine, director of the History Museum, hand-carried the plates from New Mexico and attended the commissioning ceremony at the Norfolk Naval Base in Virginia, along with fellow New Mexicans: Ret. Admiral William Payne, a state senator; Senate President Tim Jennings; Tourism Secretary Michael Cerletti; and Veterans Services Secretary John Garcia. Best part? “I got to go on the sub,” she said. 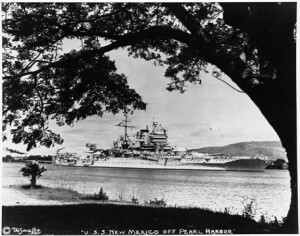 Their history goes back to 1918, when the state of New Mexico commissioned Tiffany to create the service for the USS New Mexico. The battleship served as the first flagship of the United States Pacific Fleet, and was a vital part of U.S. operations in the Pacific Theater of WWII. The pre-landing bombardment of Luzon began on January 6, 1945, perhaps appropriately, the state of New Mexico’s 33rd birthday. The sky was full of kamikaze planes. A suicide hit on her bridge killed the commanding officer and 29 others, with 87 injured. The remaining crew made emergency repairs and her guns remained in action until our troops got ashore on January 9th. After repairs at Pearl Harbor, she headed to Okinawa for the invasion there. This time the enemy threat was from suicide boats. On May 11, she destroyed eight of them. The following evening, the New Mexico was attacked by two kamikazes. One plunged into her. The other hit her with its bomb. In the resulting fires, 54 men were killed and 119 wounded, but she continued to fight. On May 28, she departed for repairs in the Philippines to be readied for the invasion of Japan. On August 15, while sailing toward Okinawa, she learned of the war’s end. On September 2, she entered Tokyo Bay to witness Japan’s surrender. 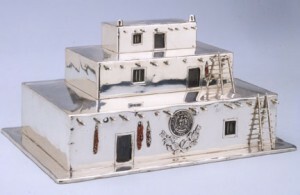 After the battleship was decommissioned in 1946, the Tiffany service was used on the carrier Midway and the flat-top Bon Homme Richard before it was donated to the Palace of the Governors. 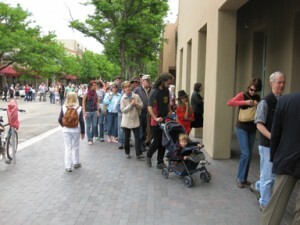 When the New Mexico History Museum opened May 23, 2009, the service was on display for the first time in decades. 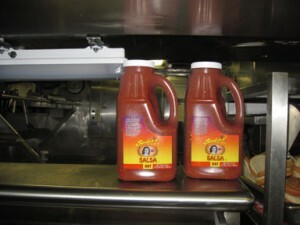 New Mexico salsa …. Talk about military might! Comments Off on Breakfast ON Tiffany’s?